Since our establishment, pharma equipments is specializing in manufacturing and supplying general equipments for pharmaceutical. Combining enrich experience with high-tech manufacturing facilities, we have steadily grown over the years and have demonstrated the potential to become a major manufacturer and exporter of general pharma equipments. 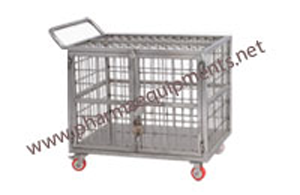 The apron hanging & storage cabinet, ss cross over bench, ss tray dryer trolley, ss instruments storage cupboard, ss cage trolley, ss shipper trolley, ss weight box trolley, ss animal cage trolley, storage rack, ss animal cage and others are known for their excellent features such as robust design, high storage capacity, less floor space consume.